The Information Services and Flood Warning Program staff worked with their weather data vendor, Weather Decision Technologies (WDT), to test gage-corrected quantitative precipitation estimates (QPE_GC). The District’s goal was to assess the value of QPE_GC for the Flash Flood Prediction Program (F2P2) both in real-time and for verifying message-level rainfall on a daily basis. The District’s automated local evaluation in real-time (ALERT) rain gage network was used to adjust radar-derived rainfall estimates in real-time (every 15 minutes). WDT’s resulting QPE_GC product was provided in Geographic Information System (GIS) format with 1-km resolution as a running total for the previous 1, 3, 6, 12 and 24-hours. The Community Collaborative Rain, Hail and Snow (CoCoRaHS) volunteer observer network data were used for statistical analysis to independently verify QPE_GC estimates. The map above illustrates the combined display from integrating 24-hour precipitation estimates in inches from CoCoRaHS (white), District ALERT gages (yellow) and QPE_GC. Such maps were used by District staff to assemble statistics for the F2P2 on days in which flood threat messages were issued to local jurisdictions. 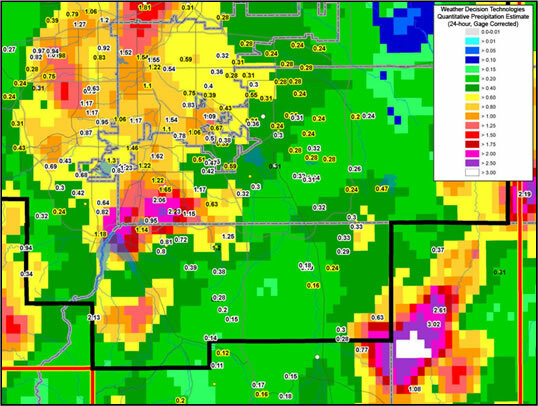 In 2008 the District will be working with WDT to assess the value of basin-averaged QPE_GC for flash flood prediction. The basin average product should help local officials compare real-time radar precipitation estimates with flash flood guidance tables and other threshold criteria set forth in basin-specific flood warning plans. The WDT products may also be used to drive real-time runoff models and inundation mapping. The graphic to the left represents work WDT is performing with help from the District to assess the overall accuracy of the QPE_GC product in comparison to standard NWS radar-derived precipitation estimates. District staff will be presenting the results of this study with WDT at the American Meteorological Society Annual Conference in New Orleans in January 2008.